These wagons formed a small range of about 15 wagons in Belgium, built in Germany (1943) and inherited at the end of WW2. 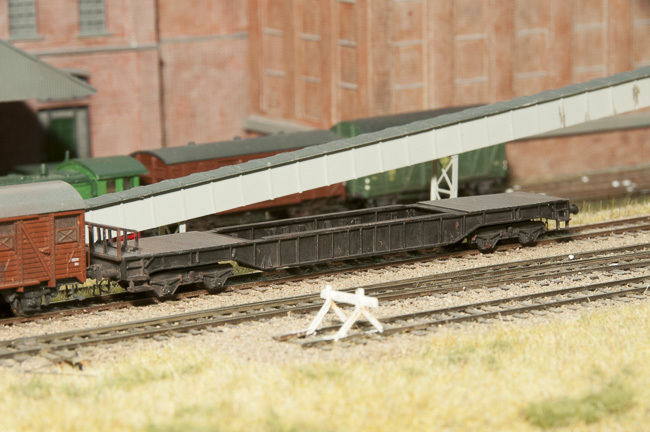 These are perfectly suited for Fremo use and can carry nice loads. Such a wagon is rather easy to built with not too many parts. It is based upon a top floor with some planking, 2 profiled sides with a lot of strips of which cutting to length and gluing these was most of the work. The bottom is another sheet similar to the top floor. The base material is 0.3 mm polystyrene sheet, except for the cross members which were done in 0.8 mm, twofold back to back. Thus it is all single sided work. A 2D scale drawing with the frame parts made in Corel, ready for cutting, applying colours for different depths and cutters. Mostly put together, but here you can see the pocket for the weight, it is not in the drawing but replaces the parts drawn in yellow. Some lead for weight with a hole to allow for the pivot of the bogies. Testing the riding height with some alternative bogies, this reveals that some cuts are required to create space for the flanges of the outer axles. During building the weight became of concern, therefore I decided to make a compartment in the ends on the fly. This is filled with a strip of lead, 1.5x13x29 mm each. The whole frame took a friday evening to put together, but producing the drawing took considerably longer. The above photo shows the frame more or less complete, although the eagle eyed will notice a failing strip and some shortcuts. 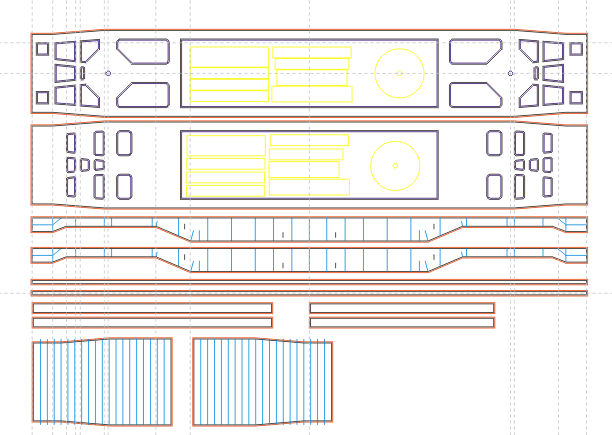 I have to finish this project with a set of bogies, the sides of these are already drawn, but they have to be completed with some spring packets. Basically this is a copy and paste job from another wagon done in 3D. To make the bogies more robust it will be best to construct a metal innerframe and glue the plastic parts against this. Also a brake platform needs to be mounted but this can probably be made up from some commercial etching. The bogie frame as single fold up milled in 0.25 mm brass prepared for 1 mm tophats. 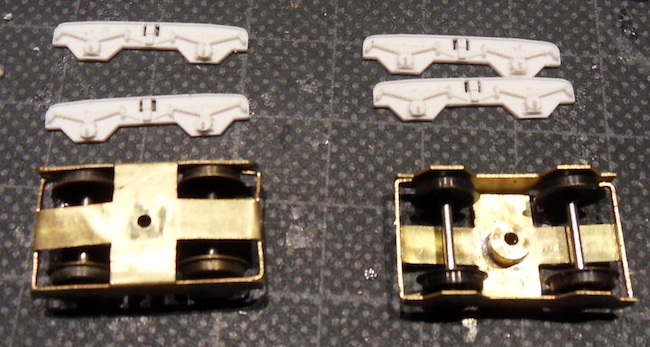 The bogies, 4 sides done in 3D, each made as 3 parts out of 0.8 mm ps sheet, the oilboxes are glued on top of the base. 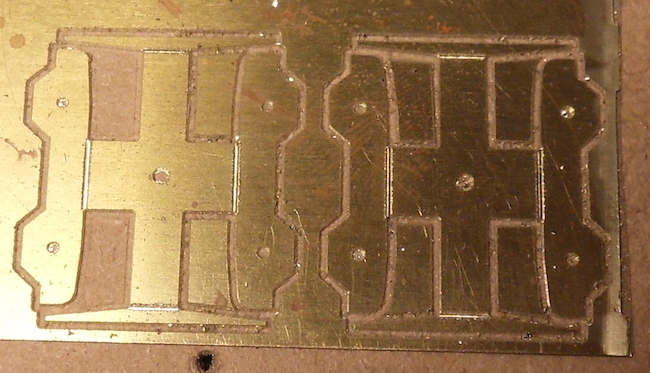 The pivoting is around a M1.4 screw with a 2 mm high brass section soldered at the bottom to limit the play. 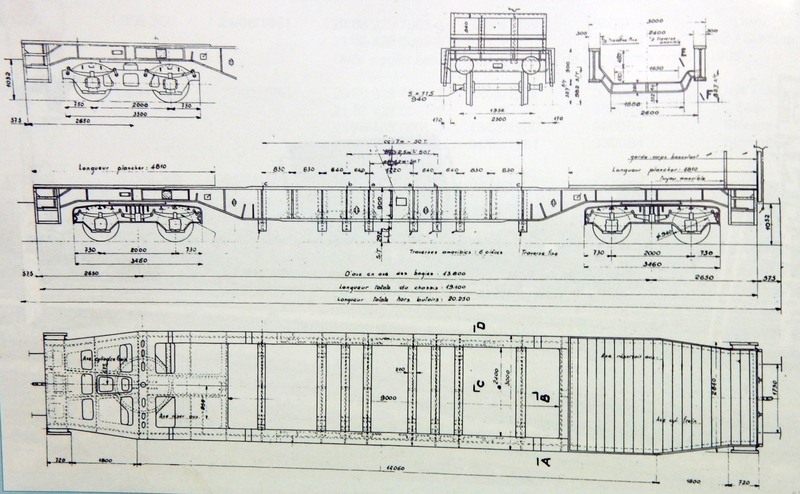 An addition to the drawing can be the integration of braking blocks but these will be absolutely invisible when the wagon stands on track. Pushed to completion, although the balustrade, from my spare box with replaced parts, will most likely be replaced at a later date by an etched version as this one looks a bit coarse, also the brake handle is on the wrong side compared to the drawing. The steps can be integrated into the drawing to arrive at a more robust design. The linked high res image shows that the already drilled holes in the side panels still need their wire loops to assist fixing loads. Airbrushing some colour will then follow and after that it is certainly time to make work of ordering custom made decals to finish a whole series of home built wagons. Painted and my attempt to some weathering. Now its waiting for some decals.